The PlayStation Vita is the most powerful handheld gaming system on the market, yet it still can't display more than 100 games and apps at a time, according to disgruntled users. 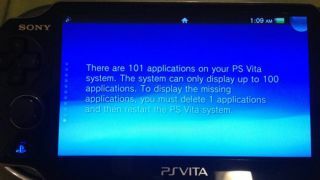 This annoyance was pointed out by NeoGAF forum member shagg_187, who posted a photo of the PS Vita error message that appeared when he tried to load 101 apps onto the system. "What's the point of buying a 32GB memory when I can't keep all my games and applications in it?" he asked. Yes, Sony's awkward limitation applies to even its largest memory card size, the 32GB offering which, to rub salt into the wound, is limited to a proprietary version. Of the 32GB, the user had 9GB left, he clarified in a follow-up forum post. He broke it down to around 50 minis, 10 PSOne titles, 20 or so mandatory apps, and 20 Vita/PSP games/apps. "I don't want to delete anything; that's the whole point of digital distribution!" said the forum member. "I have over 140 apps/games on my iPhone, I'm sure Vita can do better!" The problem may be compounded by the fact that some PS Vita game save files are associated with the bubble icon. According to users, this doesn't apply to minis, PSOne and original PSP saves, which are said to be independent of the application bubble. TechRadar contacted Sony about whether or not a PS Vita patch was in the works. A Sony representative said that it was "checking on the request with the hardware team." In the meantime, shagg_187 and users experiencing the same PS Vita error are going to have to be much more selective about their app downloads. "Not purchasing any more Vita titles until I see one that's worth the '100 bubble list,'" said shagg_187. "I guess now I know how it feels to be on the receiving end of a stick."